Chula Vista, CA used to be known as just the city near Tijuana, but now it’s become a popular destination for many tourists and home buyers. Chula Vista, which means “Beautiful View” in Spanish, is the second largest city in the San Diego Metropolitan area with a population of over 250,000. One of the reasons Chula Vista has become so popular in the last 15 years are all the new Master Planned Communities that are located east of the 805 freeway. You can buy more house (price per square foot) in a safe family environment, than almost anywhere else in all of San Diego County. These Master Planned Communities include Otay Ranch, Eastlake, Rolling Hills Ranch, San Miguel Ranch and Rancho Del Rey just to name a few. All of these communities are designed for the outdoor enthusiast. Most of the homes are close and have easy access to walking and hiking trails, community pools, parks, schools, shopping and the freeways. Chula Vista is located between the foothills of Jamul and the San Ysidro Mountains with San Diego Bay on its west and the Sweetwater River to the north and south. 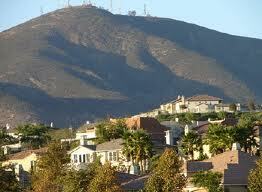 The city of Chula Vista is very close to the Mexican border, situated only seven miles away. In fact, Chula Vista is just seven miles from Downtown San Diego as well, giving the residents and tourists easy access to America’s Finest City. A very unique feature to this city is the year-round United States Olympic Training Center benefiting thousands of Olympic hopefuls. Opening its doors in Chula Vista in June 1995, this venue is designed to accommodate visitors with self-guided and escorted tours, all at no charge. The Center has sport venues and support facilities for the Olympic sports of archery, BMX, canoe/kayak, cycling, field hockey, rowing, soccer, softball, tennis, track & field and triathlon. The Cricket Wireless Amphitheater is also located in Chula Vista and is only 15 minutes from Downtown San Diego. With a variety of musical acts, this venue has become one of the most popular outdoor venues in all of San Diego County. Another well-visited venue in Chula Vista is The Nature Center which is home to numerous unique animals and plants of Southern California. Located just six miles south of Downtown San Diego, The Nature Center sits on 316-acres of the Sweetwater Marsh National Wildlife Refuge. From old established neighborhoods, to the newest communities in Eastlake, Chula’s Vista is a great place to call home.